Over the centuries, mankind has used the printed word as a way to exchange ideas, share histories, keep records, and entertain others. As the world became more digital, many assumed that printing would become essentially obsolete. What has changed is the way people think about printing and the potential impact their actions may have on the environment. At HP, we’ve been working to reduce the amount of materials used to make our printers and phase out substances of concern in those products. We’ve also developed HP EcoFFICIENT Paper, which is 25 percent thinner than typical office paper. This means fewer trees needed to create this paper and an environmental impact that is at least 30 percent lower compared with industry-standard office paper in the U.S. This effort supports our goal of achieving zero deforestation, in which all HP brand paper and paper-based product packaging* will be derived from certified and recycled sources by 2020. To achieve the quantum improvements in environmental performance we all want, we must reinvent the very nature of printing. One way HP is doing this is by developing commercial print solutions that help organizations shift from analog to digital printing. These solutions, which are already in use around the world, enable on-demand, customized printing of materials, including marketing collateral, labels, signage, and packaging, that helps companies create more tailored materials with less waste. For example, companies like Coca-Cola, Emerald, and Nestle have used HP Indigo digital presses to create highly-customized and personalized packaging for their products — delivering unique content targeted to specific audiences in an efficient and cost-effective way. But HP’s commercial printing solutions are about more than just customization — they also help companies reduce the environmental impact of printing. For example, with HP PageWide Web Presses there are no plates or shells to produce, store, nor dispose of after a print job is completed. Also, digital printing doesn’t create “make ready” waste at the start of production, like traditional analog technologies. And HP PageWide Web Presses use water-based ink technology and specially engineered bonding agents that do not require hazard labels — helping create a better work environment than in many analog printing workplaces. By enabling companies to print materials where and when they need them, digital printing also eliminates storage, packaging, and shipping costs, and lowers greenhouse gas (GHG) emissions related to transporting materials. One of the key industries being transformed by digital printing is the book publishing business. Traditional printing processes usually require very large production runs to be economically feasible. Unfortunately, publishers oftentimes overestimate demand. In fact, according to The Economist, about 30 percent of books in America are returned to the publisher unread. Shifting to a digital printing methodology can help publishers reduce waste and costs. Courier Corporation, a full-service book manufacturing and specialty book publishing company, is a good example. One of its subsidiaries, Dover Publications, specializes in reissuing books that are no longer in print by their original publishers. Dover has a specialized book list that covers a wide variety of subjects, including literature, history, sciences, and even sheet music, with variable print sizes and run lengths. By shifting to digital on-demand printing, the publisher has been able to cut inventory by 28 percent, reduce warehouse space by 19 percent, and bring 1,100 titles back into print through on-demand processes. HP has continued to look for ways to transform how whole industries design, make, and distribute products — now focusing on digitizing whole supply chains and production via 3D printing technology. While 3D printing has been around for decades, it has mostly been limited to prototyping and tooling. 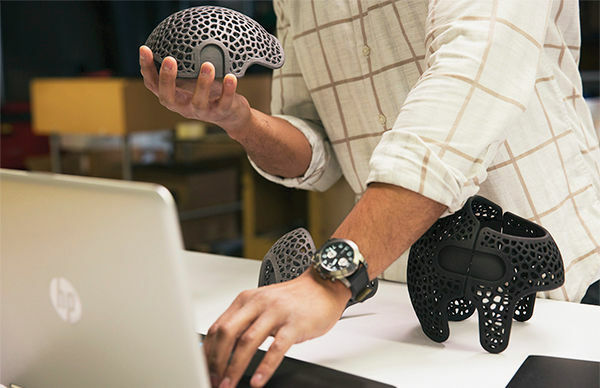 Today, technology, such as HP Multi Jet Fusion 3D printing technology is helping accelerate full-scale manufacturing and just-in-time production across all industries. And the technology is doing it in a more efficient, economical, and environmentally-conscious way. 3D printing can reduce the amount of materials, time, and costs needed to make a finished part by realizing complex shapes or redesigning complex assemblies into a single part. HP itself uses 3D printing in the design and manufacture of parts for the HP Multi Jet Fusion system. According to a Deloitte University Press report, BMW, an HP Multi Jet Fusion customer, has reduced tooling costs by 58 percent and project time by 92 percent. A BSR case study on aerospace manufacturing indicates that 3D printing can lower raw materials waste up to 40 percent. And Nike has reported that using additive manufacturing to make certain shoe models has reduced waste by 80 percent. Additive manufacturing can also lower the environmental impact of design and manufacturing. According to Siemens, which uses 3D printing to create industrial gas turbines, the company has reduced GHG emissions by 30 percent and resources used throughout the production process by 63 percent. By helping companies better match supply with demand, 3D printing also eliminates the overprovisioning of materials, parts, and finished products. Companies can now create virtual inventories in which products are made as needed, rather than physically stored for later use — or worse, never used at all. Similar to what digital printing has done to eliminate make-ready waste, inventory, and material use in two dimensions, we also expect 3D printing to transform manufacturing. And since companies can now transmit digital files for production locally rather than shipping physical goods, 3D printing can also reduce emissions related to distribution. According to a study published in the Energy Policy journal, by shifting to more localized supply chains, 3D printing could reduce as much as 525.5 million metric tons of CO2e emissions by 2025, the equivalent of taking more than 110 million passenger vehicles off the road for a year. The need and desire for printed materials is not vanishing in our tech-driven world, but technology is changing how the world prints. Through more sustainable product innovations, lower carbon- and energy-intensive business models, and by fundamentally transforming supply chains and entire industries, HP is reinventing printing for a better world.